I’m sure almost all of us are familiar with Abraham Lincoln. Even if you don’t live in the United States, you must have learned about him and his presidency somehow. Steven Spielberg has directed the epic biographic movie of Lincoln. Will it show the Lincoln we know or the Lincoln we don’t know? It’s January 1865. Lincoln has been re-elected President back in November. However the Civil War is entering its fifth year. It has been the most brutal war on American soil in terms of destruction and fatalities. The Emancipation Proclamation, the law completely abolishing slavery, is being debated in the US House of Representatives. Politicians from both the American states and the Confederate states debate it. Both sided stand firm in their beliefs. Meanwhile Abraham Lincoln and Thaddeus Stevens–a strongly anti-slavery Republican who demanded total war on the Confederate States– are waiting and debating as the Proclamation is nearing its vote into law as the Thirteenth Amendment. However the Republicans want the vote delayed because they fear the outcome and want the War to end. Lincoln doesn’t want to wait. He wants slavery over before the Confederate States can be reintegrated. This takes an impact on how people view Lincoln. Lincoln is one president who’s willing to meet with Civil war soldiers on the ‘Yankee’ side and hear the stories they have to tell. Many politicians view him as a wise communicator who always has an interesting tale of past history that will make one think about the present. However Lincoln loses some appeal as he’s unable to convince Republican Party founder Francis Blair in his method of dealing with the Confederates instead of peace negotiations. He even senses possible political tension in Stevens desire for racial equality included with ending slavery, fearing the Thirteenth Amendment won’t pass. He a meets up with Secretary of State William Seward with a plan to convince the Democrats to support the amendment with offers of federal jobs. His family life is also impacted by this all too. Lincoln is adored by his youngest son Tad. His wife Mary is known for her outlandish mouth and is frequently involved with spats with Abraham and even breaks down whenever their late son Willie comes up in conversation, especially since it’s possible their oldest son Robert might have to fight. Meanwhile Robert returns home from his law studies as he had just been named Union Captain to General Ulysses Grant. He’s studying to be a lawyer like his father but is willing to fight in the war if he has to. That leaves Abraham very uncomfortable and even coming to some confrontations with Robert. It would take time for the Civil War to end: April of 1865 to be exact. Then on April 14, 1865 Lincoln is in a meeting discussing measures to give suffrage to blacks when he is reminded Mary is waiting for him at Ford’s Theatre. That night…the rest is infamy. Nevertheless we’re reminded of the man who is an integral part of history with a flashback to his Second Inaugural Address. The best thing about the film is that it does not just focus on Lincoln the maverick politician but Abraham Lincoln the person. He was a friendly talker and did his best to be a good father and a loyal husband but he was also stern in what he believed. It was not perfect because he wanted the Emancipation Proclamation to pass but knew that mention of equality for blacks would deter many Representatives from giving it a ‘Yay’ vote. He was as much a strategist as he was an idealist. He knew any chances of equality would be a step-by-step procedure and emancipation was the first step. He knew of the bloody war happening and of the Confederate’s rebellion but he knew it had to be done. Another excellent quality of this film is that it shows the political climate of the time. We should remember that the United States of America wasn’t even a century old at the time and slavery had existed in the South long before the United States of America was formed. There were many laws and disputes debating free states and slave states over the years to the point that slavery was going to reach its end but the South refused it to the point they would form their own nation: The Confederate States of America. The North, the United States, wanted to see slavery end throughout the whole United States and were even willing to have this war to make it happen even in the South. The South, the Confederates, knew that they would lose but they valued slavery to the point that they were willing to fight for it in such a brutal war. Even though they knew they were losing, they were willing to fight for it over these four long years and despite the huge losses they suffered. The debates in the House Of Representative from the various states’ Representatives showcased the ideologies both the United States and the Confederate States felt. Nowadays we all can’t imagine slavery from happening but back then the South valued slavery to the point they would try to start their own independent nation and fight a long bloody war to keep it alive. And even the politicians in the American offices upheld their convictions in debates. The film also reminds us that the Emancipation Proclamation may have been written by Thaddeus Stevens and introduced to the House Of Representatives by Lincoln but it required the House to vote it into law. It almost didn’t happened and if it didn’t, Lincoln may have gone down in history as one of the lesser Presidents of the United States. We’re reminded in the film what kind of gamble Lincoln was making. Another thing to notice in the film is Spielberg’s infatuation with war. We have seen it before with World War II with Saving Private Ryan and Empire Of The Sun, World War I with War Horse and we see now see Spielberg’s depiction of the Civil War and it has a lot of details. It details the artillery that was used at the time. It details the gruesome destruction and bloodshed that occurred. It even depicted the communication between officers and of relaying news to soldiers via Morse Code. Spielberg does it again. Spielberg gives another directing effort under his belt. Already we know Spielberg to master sci-fi thrillers, sci-fi family adventures, and war dramas. Now he creates an ideological drama that focuses less on the war and more on the focus of the historic individual and the times he was facing. The film did an excellent job in focusing on the political climate of the times as much as the main politicians involved. The film however couldn’t have been done without the excellent acting. Daniel Day-Lewis gave an excellent performance as Abraham. The may have focused mostly on a single month of Lincoln’s presidency but his performance spoke volumes of the President we thought we knew. The movie however was stolen frequently by Tommy Lee Jones as Thaddeus Stevens. Tommy Lee did a great job in showing Stevens in his mannerisms, beliefs and how fierce of a man of conviction he was. Sally Field was also excellent as the troubled Mary Lincoln. History has documented her as a woman with mental illness. Field’s performances showcase her outlandish personality but also shows her as a woman both troubled by her losses and fearing for her future. Joseph Gordon Levitt was not so good at undoing his body and talking from modern mannerisms but he was better at conveying Robert the person in his ambitions and fears. The screenplay by Tony Kushner is an excellent adaptation which is able to make that one month in 1865 to be the defining month in the legacy of Abraham Lincoln. It was as much focused on political details as it was on the people involved. John Williams delivers another fitting score to his list of movie scores. Janusz Kaminski gave good cinematography but there were many times I felt the use of zoom-ups were excessive. The depictions of war in the movie were mostly graphic only at the very beginning but were very well-detailed in not just the battles taking place on screen. Lincoln is a surprising outlook on a president we’ve all come to know and celebrate but didn’t completely know. It’s also an excellent presentation of the political climate of the times. This reminds us of his celebrated greatness and how much of a gamble he made not just with his life but his political status to achieve it. Definitely worth seeing. You’d think a story about a young person dealing with a potentially fatal form of cancer would least make for comedy material, right? 50/50 succeeds in making a comedy out of it, and a good one too. Things change for Adam once he stars going for chemotherapy. On the plus side, his girlfriend decides to the one to look after him. She even buys him a dog. During chemo treatments, he meets a pair of older men also receiving treatments and they share a lot together, including marijuana-laced macaroons. On the negative side, his mother is concerned to the point of being overbearing especially since she also has to deal with a husband with Alzheimer’s. He also sees a young therapist who’s very inexperienced. Adam is only her third client. 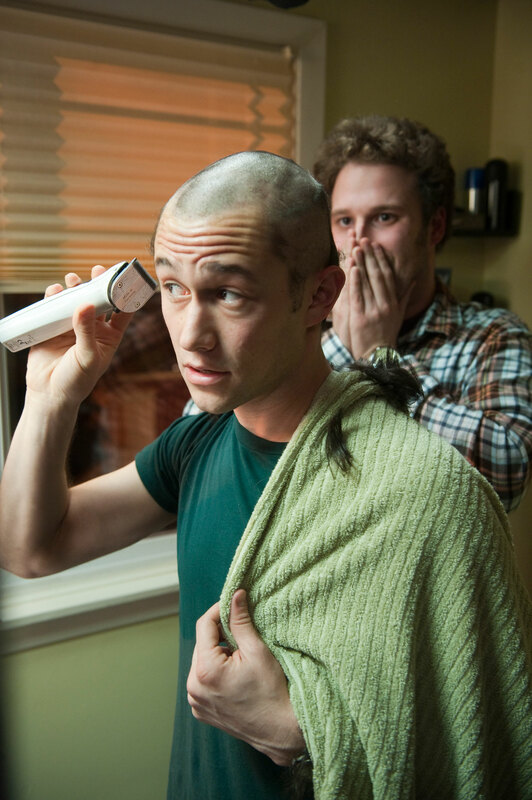 On the in-between, his friend Kyle tries to keep his spirits high by doing and saying things that are off the wall, like hold a party for Adam on the day he leaves work and gives Adam his body shaver to shave his head. Things change for Adam: some for the better, some for the worse and some for the weirder. Kyle catches Rachael cheating on Adam. The relationship is over. Kyle encourages Adam to use his dog walking and cancer ordeal to get laid. Adam stars becoming more open with Katharine the therapist. The bond between the two men he sees during treatment grows. And Rachael moves out. Adam and Kyle celebrate by egging, cutting and burning her picture for him. Then comes some biting realities. One of the men Adam meets during treatments dies. The doctor delivers the news that Adam’s cancer is worsening and needs a risky back operation or else he’ll die. Adam is now at the end of his emotional rope. He starts distancing himself from Kyle. However he starts opening up more to Katharine to the point there’s more than just a therapist-patient relation happening. Just before the operation, he learns that Kyle bought a book on having a friend with cancer. He also learned his mother attended a support group of parents who have children with cancer. It makes for an ending that not your typical simple happy ending but an ending that’s genuine. There’s no question that there are a lot of comedic elements with this movie and there are the times when the movie does try to push a few buttons. One thing about the movie that’s the best quality is that it tries to be funny but real at the same time. It may poke fun at the after-effects of eating a marijuana-laced macaroon and some of but it also focuses on human relations and the feelings one goes through during cancer at such a young age. It focuses on the relationships of the patient and those around them. Despite that, it doesn’t sugar-coat things. It also shows that nasty things like a girlfriend cheating on the Adam does sometimes happen. It also reminds you that some of your friends that are going through cancer like you could die the next day. It’s a mix of some of the nasty and some of the happier things too. That’s the strongest part of the comedy is that it’s able to balance it all out. Interestingly enough is that this comedy is based upon the cancer ordeal of the scriptwriter: Will Reiser. Who would’ve thought that a plot like this would be a winning formula? No question that the script of Will Reiser was winning. It created a good mix of humor and real life. It could qualify as autobiographical but I don’t know Will’s personal life. The acting made it work. Joseph Gordon-Levitt was the perfect fit for Adam. There couldn’t have been a better pick for Kyle than Seth Rogen. Anna Kendrick was also excellent as the inexperienced therapist who becomes the best thing for Adam. Jonathan Levine also did a good job of directing. Definitely a refreshing alternative from your usual box office fare. I will admit there was the occasional lewd and crude humor from Kyle but overall it made for an excellent movie. 50/50 was the surprise hit comedy of this fall. It has received a lot of acclaim as one of the best comedies of the year. Unfortunately it did not receive any Oscar nominations, not even for script. I’m not too worried because I’m sure with the help of DVD and Netflix this movie’s charm will last for a long time. It does seem odd to make a comedy about dealing with a life-threatening form of cancer, especially for someone so young, but it’s an example of how the younger generations are dealing with cancer. You can notice how cancer services and support groups and charities have changed over the past thirty years. Thirty years ago, the slogan was “Cancer can be beaten.” Now cancer funds and groups are using their own methods to encourage the younger generation to get involved. There are fundraising groups with the slogan “F*** cancer!” There are breast cancer funds with the slogan “I love boobies!” It may seem too in-your-face to some but it’s how the younger generation is now dealing with the fight. It’s all in the passing of the torch. Now to have a cancer survivor make a comedy about cancer that does sometimes rattle cages but is also very genuine in both the positive and negative aspects, it’s an accomplishment of its own. They say laughter is the best medicine. 50/50 is definitely worth it. Until there’s a sure-fire cure for cancer, there’s 50/50 to laugh things off.